In a Stanford basement lab in 1996 the world’s first search engine was born. But did you know it was built in a Lego enclosure? In 1996 Larry Page and Sergey Brin, then PhD students in Stanford CSD, working on the Digital Library Project, needed a large amount of diskspace to test their Pagerank algorithm on actual world-wide-web data. At that time 4 GB disks were the largest available, so they assembled 10 of these drives into a low-cost cabinet. In Nov 1999, Google Inc., by then operating one of the primary search engines on the web, provided replacement storage capacity to the Digital Library project so that we could move this original storage assembly into our history displays. As of September 2000, Google, now located in Mountain View, operated 5000 PCs for searching and web crawling, using the Linux operating system. More info and pictures can be found here. 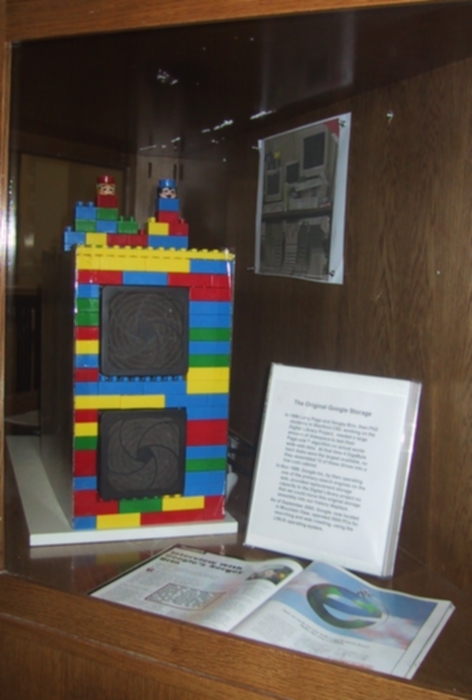 This entry was posted in Google, Internet and tagged first server, google, lego on December 26, 2012 by David.